Our current U.S. Junior Champion, 15-year-old New Yorker Robert Hess, spent his winter break playing chess at the Cannes Open (February 18-25). On the hunt for his third IM norm, he chose the Cannes Open because almost 30 GMs had played the previous year. 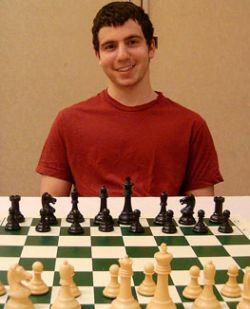 When he arrived with his coach Miron Sher, he was shocked to see only four GMs entered. "I thought I had no chance for the norm because of the weaker field." Hess finished the event with 6.5/9, and tied for 5th-9th place. His performance rating was 2483. (A performance rating of approximately 2450 is good for an IM norm.) You can see the complete crosstable here. Robert won his first norm at the 2005 Paris Open, and his second at the 2006 Las Vegas Masters. This tournament puts Robert over the 2400 mark, so his IM title should be approved at the next congress.